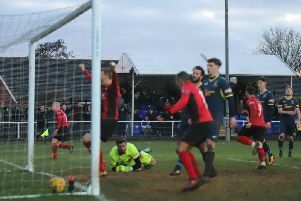 Marcus Law has laid down a challenge to his Kettering Town players ahead of their next three matches. The Poppies moved five points clear at the top of the Evo-Stik League South Premier Division Central thanks to a last-gasp 3-2 win over Needham Market at Latimer Park last weekend. 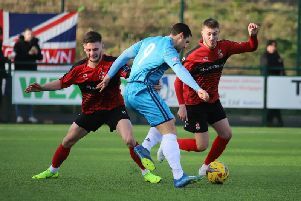 Now they are preparing for back-to-back away matches as tomorrow's (Saturday) trip to Redditch United is followed by a clash at St Ives Town before a home game with Rushall Olympic rounds off the month. It’s a trio of games that Law admitted his team had targeted before the turn of the year. But the Kettering manager knows his players will have to perform better than they did in the reverse fixtures after they were held to a 4-4 draw by Redditch United at home while St Ives stunned the Poppies with a 3-0 success at Latimer Park earlier in the campaign. “We have got 14 cup finals and the more of those we win, the more pressure it puts on everyone else,” Law said. “We must concentrate on ourselves and we are going into three games that before Christmas we felt they were ones where we could pick up positive results. “But the facts are that we only got a total of four points from the reverse fixtures against those teams so the challenge is now there for our players to try to at least double that. “It was a real humdinger against Redditch at home and they exposed some of our vulnerabilities that night but we have the knowledge that we scored four goals against them ourselves. “And we must also deal with the switch to a 4G surface and that’s something we haven’t been completely comfortable with. “We have had two games on 4G this season and, to be honest, the performances were not great, which surprises me because we have players with good technical ability. Law, meanwhile, is set to give defender Declan Towers at least one more week to rest up a knee injury.